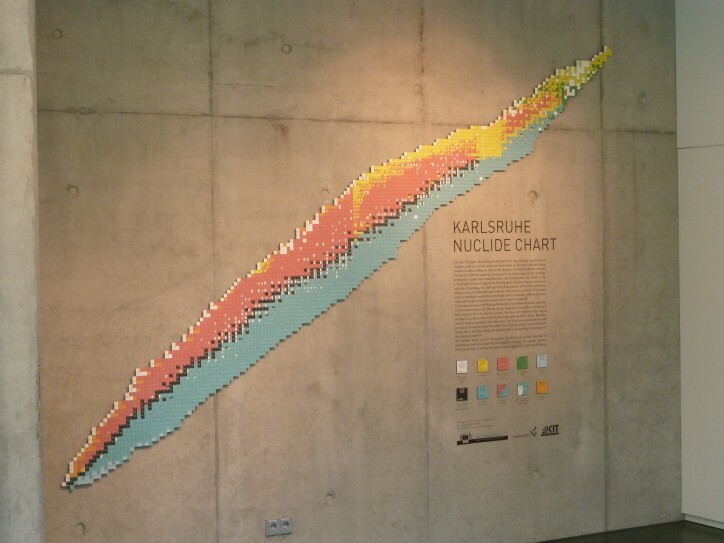 Karlsruhe Nuclide Chart – Contour Wall Chart version, Edition August, 2014. Digital print with protection foil mounted on aluminium composite panel (4mm, Dibondplatte). Contour custom cut, CNC processing. The contour island is cut a single piece. On the reverse side are pressure points and a drilling template for wall mounting. For insertion on wall area of 225 cm (height) x 340 cm (length). Legend Text: Digital transparency plot (Folienplot) 125 x 85 cm (direct attachment of letters onto the wall). This special Contour version of the Karlsruhe Nuclide Chart was made for the new European Dialogue Centre in the European School Karlsruhe. If you are interested in having such a contour version of the Chart for your organisation, please contact us at info@nucleonica.com.